One we all wanna see. Who said preseason basketball wasn’t entertaining? Me, actually. I said that — a few times now. But lorrrrdy, did we have some action in yesterday’s game in Cleveland. 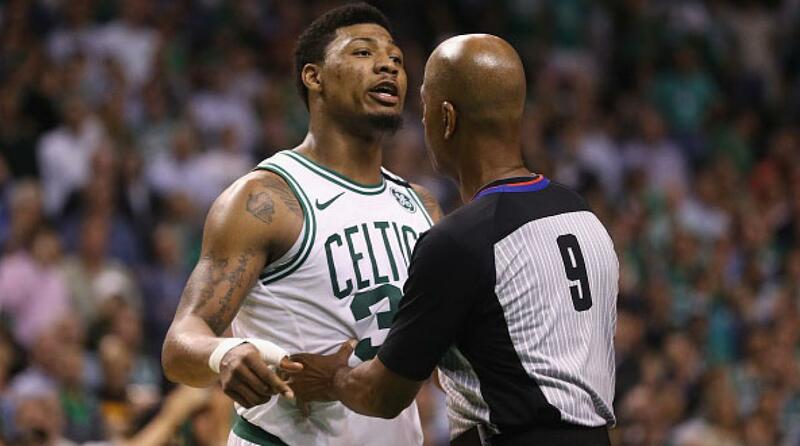 Two of the leagues most entertaining wild cards in JR Smith and Marcus Smart got into it last night at Quicken Loans arena before the first quarter had even ended. After Smith got tangled up with Aussie big man Aron Baynes, a decent shove from the Cavs guard set tensions sky high before Smart came streaming in from behind to shove JR with full force – and it was on, much to the delight of Smith. Smart was ejected for the weak move. But after the game, Smart said to the media that if ​JR wanted smoke, he would know exactly where to meet him. It seems JR didn’t just want some smoke — he wants all the smoke. Come on Commissioner Silver, let’s make this happen! Forget last night’s anti-climactic McGregor/Khabib fight, THIS one will sell tickets. Give the people what they want!